Erin tearing it up in the frigid waters of the Spokane River, Washington. If you live in an area with a climate like northern Idaho, where I do most of my boating, you may find yourself paddling in freezing temperatures with rain or snow during the early part of the season. The water and weather generally do not warm up here until mid May, so it is really important to have the right gear to stay warm during the spring runoff. I paddle all winter, so when it’s 45 degrees, raining, and the water finally warms up to 35-40, I actually get hot when boating. I paddle year-round and I’m comfortable playboating even when the ambient temperature is well below freezing. People ask me all the time in the winter, “You’re going kayaking? Don’t you get cold?” The answer is no, I don’t, and I wouldn’t be out there paddling and enjoying myself if I did. I DO NOT like to be cold, so here’s how I stay warm during the winter and early spring. First, I make sure that my body core stays warm for the entire time I’m on the water, even if my extremities get cold by the end of a session or run. To accomplish this you need a good set of base layers, well-cared-for dry wear that keeps water out and a good spray skirt. If you’re busting out the gear for the first time this year, check your gaskets and zippers and treat them with 303 Protectant and Zip Tech zipper wax. For cold weather and water, I prefer wearing a drysuit, with built-in dry socks. It keeps your body heat contained within one piece of gear, you can put your feet in the water without getting your feet wet, and you stay dry if you do happen to swim. Not all drysuits are comfortable for playboating, but I love the NRS Women’s Inversion Drysuit for every type of boating, and I wear it playboating all winter. Under my drysuit, I wear NRS WaveLite base layers. I wear a WaveLite Union Suit by itself, or on cold days (below 40 degrees) I wear a WaveLite Shirt or the Pungo over my union suit. If I double up on base layers my core always stays warm. Your core will also stay warmer if you can limit the amount of water in your boat. If you playboat with a drysuit, you will always get a little water coming in where the zipper meets the sprayskirt tunnel. Oh well, you have to get in and out of your dry suit somehow, right? Still, do your best to limit water getting in. 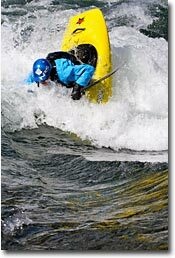 I use an NRS Drylander Shock Cord Sprayskirt and paddle Jackson Kayak boats. With a Drylander and a JK boat, the only water coming in will be through the sprayskirt tunnel; it will be minimal and only occur when you are upside down. Now how do I keep my extremities warm? I wear ski socks that come up to the knee inside the suit to keep my lower legs and feet warm. 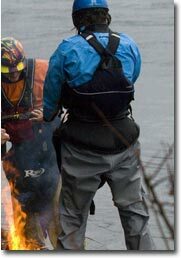 Creeking, I wear NRS HydroSkin Wetsocks over my drysuit socks and NRS Attack Shoes. My feet get cold when creeking because I am more likely to be walking or standing in the water. Playboating I just wear the NRS Sasquatch Shoes over my ski sock/drysuit sock combo, going up a size to make room for the extra bulk. And I try and keep my feet dry when I get in and out of my boat. To keep my hands warm I exclusively wear NRS Toaster Mitts. I know plenty of people who like to use Mambas (or pogies), but I go straight from no-gloves to the mitts. I find the mitts very comfortable and warm for cold water boating and easy enough to remove when you need to use a throw bag. If you like finger gloves, the NRS Maverick Gloves are warm and comfortable as well, and are designed to keep your hands totally dry. Since the HydroCuff™ top helps keep cold water out and the raw neoprene outer sheds water to prevent evaporative cooling, they are warmer than their 2-mm thickness would seem to indicate. Then, of course, you have to keep your head warm. I wear the full-cut NRS Mystery Helmet Liner, so my ears and the back of my neck are covered. And earplugs, earplugs, earplugs! It’s amazing the difference earplugs make keeping your head warm and you’re protecting your ears from cold air, cold water and infection. The NRS Storm Hood is a warmer option, but if the rest of my body stays warm, the full-cut helmet liner usually does the trick. From head to toe, that’s how I stay warm all winter and in the early spring in northern Idaho. I wear this gear to stay warm kayaking, and the same gear can also be used to stay warm doing any other type of winter water sport. Have fun and stay warm on the water!